Did you know that bees need almonds and almonds need bees? 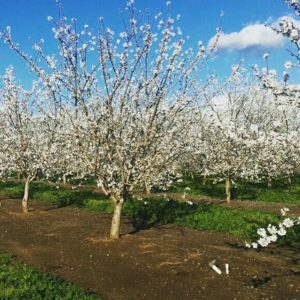 Between late February and early March, the orchards that produce Maisie Jane’s almonds burst into bloom with light pink and white flowers in preparation for pollination. This is a crucial time in the almond lifecycle. Almond trees need the bees for cross-pollination. The honey bees help move pollen from tree to tree. The bees need the almond orchards to strengthen the hive because almonds are a nutritious and delicious source of food for the honey bees – often their first natural source of food each spring. As you can see, it’s a beautiful and mutually beneficial relationship! Bees also help avoid the need to spray harmful pesticides in the orchards. How? Well, by leaving part of the almond orchards’ natural grasses in place – instead of chopping away the entire vegetation – the green foliage attracts helpful insects, which decreases invasive pests that harm the almond crop. Leaving blooms in place in the natural vegetation attracts the bee population. Purchasing almond butter – when you purchase any 12oz. jar of our almond butter at any Whole Foods market in the nation, we’ll donate $.05/jar towards bee research. Plant native plants in your own yard and garden where the bees can be safe and get good nutrition. Create buzz – spread the word and raise awareness! Without bees, there would be no almonds; and without almonds we couldn’t make our healthy, delicious almond products. Maisie Jane’s California Sunshine Products, Inc. was founded on strong beliefs and passion for offering unique, flavorful, top-quality, almond products. We strongly believe in earth-friendly practices that start on our family owned and operated orchards. We use Organic farming practices and continue in the process by using all natural ingredients with no preservatives or GMOs. We believe in honest, friendly and helpful customer relations at all levels. We take pride in every task, every day, with every person.